Make this Tangy, Spicy and Vegan Tomato Chutney to serve with Idli, Dosa, rice or any other Indian meal. It takes very few basic ingredients to make and is very easy to make. Here is how to make Tomato Chutney Recipe. Tomato chutney is the best accompaniment with South Indian breakfast or meals, such as dosa, idli, vada and meals. It is delicious and easy to make. Every family has its own recipe and it lifts the flavor to another level. 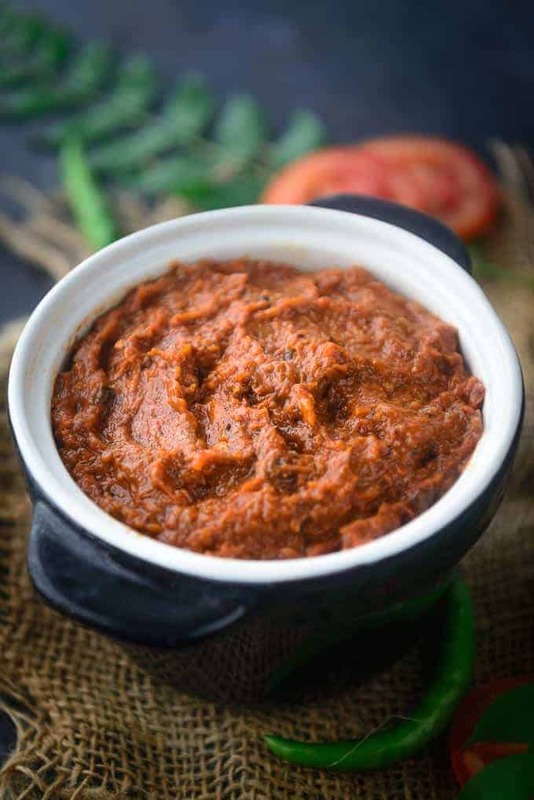 Traditional tomato chutney is made using a stone grinder (Sil Batta) with basic ingredients like tomatoes, chillies, tamarind, garlic, mustard seeds and salt. Spiciness and color of chutney vary as per the amount of chillies used. This chutney is spicy and tangy at the same time and just mind blowing. In Tamil Nadu, it is known as thakkali chutney and in Andhra, it is called tomato pachadi – there are numerous names for this chutney. You can even do a lot of variations to it. You can skip onions or add coconut to it. It is so easy to make that you would want to make it fresh every time. Tomato: Use ripe tomatoes to get the best flavor and color of the chutney. Tomato is the main ingredient of this chutney. Make sure you use fresh, ripe tomatoes. Tamarind: Adding a little tamarind adds the needed zing to the chutney, which makes it yummier. But if the tomatoes are too sour, you can skip adding it. Curry Leaves: Curry leaves in tadka add the crunch and beautiful fragrance to the chutney. Onion: I have used onions to add a little sweetness to the chutney, but if you want you can skip it. Green Chilli: Green chillies add the heat to the otherwise tangy tomato chutney. Adjust the amount according to your taste preference. Sesame Oil: Sesame seed oil adds a characteristic nutty flavor to the chutney and I recommend you don’t skip it. having said that, I know a few people who cannot stand the smell of sesame oil. If you are one of those people, use vegetable oil instead. First take sesame oil in a pan and let it heat to the smoking point. Once hot, add mustard seeds, cumin seeds, fenugreek seeds, hing and curry leaves and let them crackle for a few seconds. Once the seeds start crackling, add onion and green chilli and fry for 2-3 minutes until onion turns translucent. Add ginger and garlic and fry for another 2 minutes. Once ginger and garlic are slightly brown, add chopped tomatoes, red chilli powder, tamarind and salt to taste and mix well. Cover the pan and cook on low heat for 30-35 minutes and keep stirring occasionally. Once cooked, remove the pan from heat and let the chutney cool for a bit. Transfer the chutney in a blender and blend to make a coarse chutney. Serve hot with rice, idli or dosa. Andhra style tomato chutney is spicier and uses red chillies instead of green chillies. You will also need some urad and chana dal to make it. Add the dal in the oil and let them turn golden brown before adding other ingredients. How to make Bengali Style Tomato Chutney? To make Bengali style tomato chutney, you will need tomatoes, dates, panch phoron, red chillies, ginger, sugar and mustard oil. Heat the oil and add panch phoron and red chillies. Once the seeds start to crackle, add ginger and cook for a minute. Then add tomatoes and cook until soft and pulpy. and add chopped dates. Then add salt, sugar and the water and cook for 10 min until it thickens. Serve it cool. You can keep it refrigerated for 4-5 days in an airtight container. How to make Sweet Tomato Chutney? Tomato Chutney can be made sweet as well and it tastes delicious too. I have a detailed recipe to make Sweet Tomato Chutney here. Do check it out. Can you freeze Tomato Chutney? Yes, you can make it in bulk and keep it in an airtight container in the refrigerator for up to a week. If you like, you can freeze the chutney in individual portions and thaw it at room temperature and heat it in microwave before using. 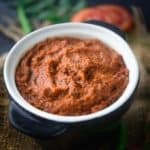 What to serve with Tomato Chutney? You can serve this tomato chutney with dosa, idli, uttapam, vada, rice and meals. It tastes amazing with parathas and sandwiches as well.How to make Tomato Chutney Without Onion? If you want to make this chutney without onion, just go ahead and skip the onion. You can follow the same recipe as is apart from skipping onions. Once the oil is hot, add mustard seeds, cumin seeds, fenugreek seeds, hing and curry leaves and let them crackle for a few seconds. Add onion and green chilli and fry for 2-3 minutes until onion turns translucent. Add ginger and garlic and fry for another 2 minutes. Add tomato, red chilli powder, tamarind and salt to taste and mix well. Cover the pan and cook on low heat for 30-35 minutes. Stir a few times in between. Remove the pan from heat and let the chutney cool for a bit. Transfer the chutney in a blender and blend to make a coarse chutney. Serve hot with rice, idli or dosa.